In our home the Christmas tree stays up until Epiphany so we're still in full celebration mode here. We also have all of our Christmas books out and continue to read the stories during winter break. 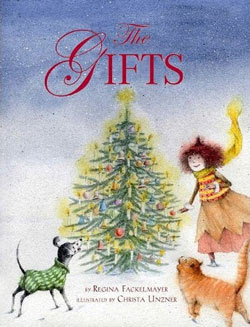 We recently checked out The Gifts by Regina Fackelmayer from our library and enjoyed it so much that we ordered our own copy to add to our Christmas children's book collection. A kindhearted and independent young girl named Mia finishes her holiday shopping on Christmas Eve and purchases a little Christmas tree in a pot. On her way home she encounters a bearded old man who has fallen on an icy patch, and she helps him pick up all of his packages. When she arrives home she realizes that she left her tree behind when she stopped to help the man. She goes back out into the snowy night to search for it but, instead of finding her tree, she meets a sad young boy who has lost his hat. With a smile, she gives him her own new hat. Her generosity does not go unnoticed. Later that night, she receives a very special gift of her own from two magical visitors (one looks a lot like Santa). The Gifts made it on last year's The Horn Book Magazine's Holiday High Notes and rightly so. This picture book glows with holiday warmth and focuses on the spirit of giving. Through simple acts of kindness, Mia helps others and spreads Christmas joy. Unzner gives the illustrations a wonderful hazy and sometimes snowy feel by speckling all the pictures with small splatters of paint, and this technique adds to the fantasy. The mystery of what happened to Mia's tree had my kids on the edge of the couch wanting to learn the outcome. They also loved Mia's pets -- her dog wears a silly green sweater! The book was first published in Switzerland under the title Ein Weihnachtsbaum für Mia (A Christmas Tree for Mia). Did your kids give any gifts from the heart this year? Every year my daughter paints special pictures to give as gifts. (See past creations: 2009 and 2008). This year she decided to paint Christmas trees. 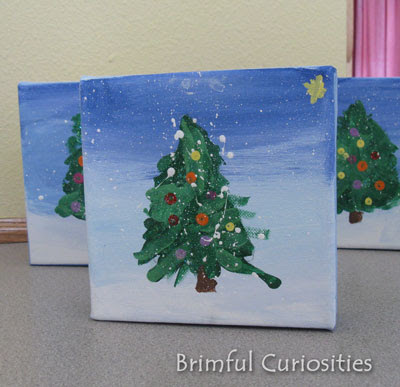 She used the glittery tree on the front cover of The Gifts as inspiration for her paintings and enjoyed learning how to make snow speckles like Unzer's by flicking the bristles of her brush with her fingers. What beautiful paintings! I'm so impressed!!! The book looks like a keeper - we'll have to check it out. Enjoy your extended Christmas celebration! This sounds like a wonderful book to have. I'm adding it to my TBR book list. Your daughter's paintings are very pretty. What a wonderful gift idea! Your daughter is a very talented artist! How old is she? I actually put all of our Christmas decorations away today. All that is left is a bare tree waiting for my husband to take out to the curb and the kids still have their little trees set up in their rooms. If they have their way, the trees might not ever get put away. Your daughter's paintings are wonderful, and the story looks pretty interesting. I bookmarked it for the next Christmas. Wow! Her paintings are great. I bet the recipients were very happy. Your daughter's paintings are beautiful! Sweet story! Your daughter is quite an artist! !